We spent over 48 hours researching and testing 17 different cat scratching posts and found that construction, levels, and cost were most important. The Molly and Friends Sisal Scratching Post scored high marks in every category and is our top pick. It measures 27” in height and is wrapped with sisal to provide your cat with plenty of scratching room. The bed on top gives them a comfortable place to sleep and hang out. The base measures 18” x 18” and are covered in neutral carpet so it goes well in any room of the house. One thing that all cats seem to love to do is sharpen their claws. If they are outdoor cats, they will do this on wooden fence posts, trees and other wood items. If they are indoor cats, you will find that they will use many things you may not want them to such as your expensive furniture, your door frames and anything else they can find to alleviate this urge and get their claws in shape. It’s a natural activity and expecting your cat or cats to not do it will only serve to frustrate you AND your cats. These top rated cat scratching posts are perfect for providing your cats with the outlet they need. All three of them are made well and have unique designs as well. These customer favorites earn high ratings for their construction, design and cat likeability. One of them may be the perfect choice for your cats. This terrific cat scratching post by Molly and Friends has a convenient cat bed right on top. It’s very simple yet the perfect piece of furniture to give your cats a place they can scratch to their hearts content without worry of ruining anything of importance. There is no assembly required and this product is made in the USA. Solid pine poles are used for the construction and heavy duty screws hold the bed and bottom in place securely. The post is wrapped in thick, all natural sisal rope, a natural favorite among cats that will stand up to the daily use his or her claws will give it. You will have 27” of this great sisal wrapped scratching post and a comfy cat bed on top that has plenty of room for your cat to lie down comfortably. The base is 18” x 18” and both the bed and base are covered in beige carpet so it will look great in any room you choose to put it in. Remember that cats like to be where the action is, so place it in a fairly busy area that your cat loves to hang out in. This is a very solid, durable cat scratching post that your cat will enjoy for a long time to come. 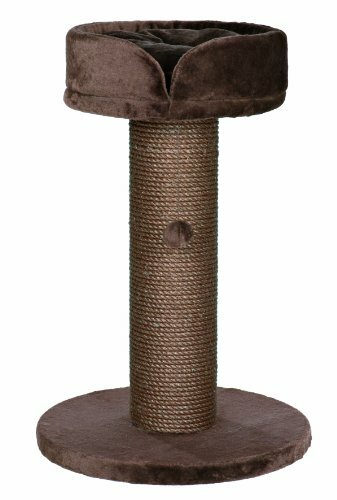 Not only can your cat use this rich, chocolate brown cat scratching post for sharpening its claws, it can use it to take a nap, play and observe as well. The extra thick sisal rope that wraps around the post naturally attracts cats to use it for scratching instead of your expensive furniture, carpets or doorframes. The top platform can be a bed attached to the top of the post, or it can be removed and used somewhere else as a bed. The plush cushion insert is super comfortable for your cat and can be washed in the washing machine on the gentle cycle for easy cleaning. In addition to the scratching activities it provides, there is a dangling plush toy for the cat to explore and play with as well. The deep, attractive chocolate brown goes well with most decors, so it will look great in the living room or den so your cat can hang out with the family while they scratch to their hearts content. This simple yet effective cat scratching post measures 23” x 23” x 35” and weighs a sturdy 35 pounds for extra stability. It is perfect for cats and kittens of all ages and sizes. It also comes with a one year warranty as well. The unusual design of this cat scratching post will keep your cats occupied and satisfy their need to scratch at the same time. 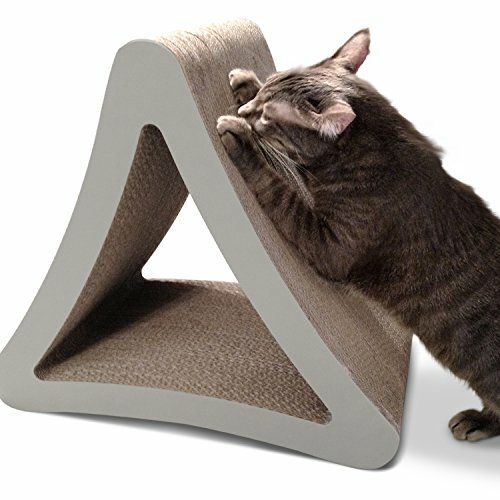 It’s the perfect cat scratcher for the pet owner that wants something unique and different for their cats to play on and use. Constructed of very dense cardboard that cats love, it has a full three sides for the cat to use so your cat gets 3 times the use from this one cat scratcher. The cubby hole in the center makes a great place for the cats to play as well. Some lay even like lying in the cubby hole and resting. This interesting and unique design won the Cat Fancy Magazine’s 2014 Editor’s Choice Award for #1 best new product and once you’ve seen your cats with it, you’ll know why. The curves are very appealing to cats and make it very enjoyable for them to scratch and play on. The measurements for this cat scratcher are 24”L x 10.5”W x 21.1” h. The silicone floor grippers keep it from sliding around when your cat tries to use it. You also get premium USA catnip leaf to train them to use it for its intended purpose. 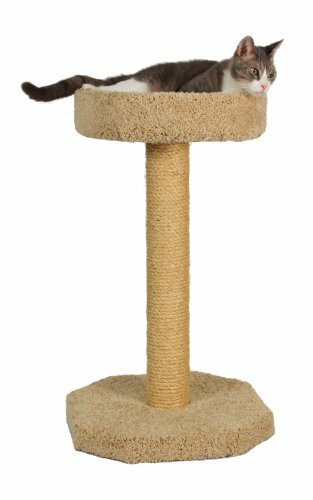 Save your furniture and doorframes and get this great 3 sided cat scratching post. You and your cats will be happy with the results. All three of these top rated cat scratching posts offer your cats the perfect place to sharpen their claws. In addition, all three are great play places as well and two of them offer your cats a place to snooze if they are inclined to do so. Simple in design and big on quality and performance, any one of these top rated cat scratching posts will satisfy your cats’ need to scratch. Providing your cat with an outlet for this natural and common activity means that once they are accustomed to using it for what it is intended for, your furniture, carpets, curtains and door frames are safe from their destructive claws. Continue reading below to learn how to choose the right cat scratching post for your cats’ needs. Some are definitely better than others and we’ll give you the information and features to look for so you are not just guessing. A cat scratching post’s name is a good description of what it is. It is a post that cats use to sharpen their nails, stretch and get their urge to claw things relieved. All cats will sharpen their nails, using anything that strikes their fancy, so by providing something specifically for this purpose can save your expensive furniture, door frames, carpets and curtains. They come in all shapes and sizes and some even have toys or a platform on the top of the post for the cat to sit or lie on. Having more than just one cat scratching post is a good idea especially if your cat hangs out in different rooms regularly. Put the cat scratching posts in the rooms they hang out in and they will not have a reason to use anything else. There are three basic kinds of cat scratching materials that are used to make posts: sisal rope, carpet and corrugated, heavy duty cardboard. Each material has its benefits and drawbacks. We’ll go over each material below so you can see the differences and decide which one would be the best for your cat. Sisal Rope – This type of material can be in rope or weave form and is typically more expensive than carpet cat scratching posts. If a sisal rope scratching post is inexpensive, that may be an indication that it is not real sisal rope. The thicker the sisal rope, the better quality the cat scratching post is and the longer it will last. The color of sisal rope can be anywhere from a light beige to a cream color. It can also be dyed but in general it is not recommended to buy the dyed sisal rope unless you know 100% what kind of dye was used. Some dyes can be toxic and although most cats don’t eat or chew on the sisal rope, it’s not a chance you would want to take with your pet. Sisal rope will not shed but after awhile you may notice some strands are getting pulled out and will hang from the post. You can trim the strands if your cat scratching post starts to look “shaggy”. One of the biggest pluses about sisal rope cat scratching posts is that they are durable and last a lot longer than carpet covered posts or cardboard. Most cats prefer sisal rope because of the scratchy feel of it and the sound it makes when they scratch it. Every cat will have their preferences, but overall, the percentage of cats that prefer sisal rope posts is much higher than the other materials. Carpet – The cheapest type of cat scratcher is the carpet covered cat scratching post. There are many more color choices available for carpet covered scratching posts which makes them more easily integrated into the home’s décor. You want to look for thick, dense carpet which will last longer. Carpet is not as popular as sisal rope for many reasons. It can look messier than rope, because it will pick up hair from your cat as he or she rubs against it. In addition, the carpet covered posts will begin to lose their fibers over time so there may be some mess on the floor around the post after the cat has used it. Some of the Berber or loop carpet can cause long strings to be pulled out of the carpet. If this happens, you can use scissors to trim the long pieces. Carpet cat scratching posts are not as long lasting as sisal rope posts, but some pet owners just prefer the look and feel of them. Although you may have to replace them sooner than you would the rope variety, if carpet is your preference, there are many styles on the market that have carpet as the covering. Some cats also just prefer the feel of carpeting over the feel of the sisal rope. Even on the sisal rope cat scratching posts, the bases are usually covered in carpet, so that may be a way to get the best of both worlds for your cat. Corrugated Cardboard – This is the least expensive and shortest life span cat scratching posts on the market. Some cats just prefer scratching cardboard. There are several different styles of corrugated cardboard cat scratching posts to choose from. Even though the cat may make somewhat of a mess when clawing the cardboard, if they like the feel of it, they will really enjoy posts with this material on them. You may have to replace corrugated cardboard scratching posts much more often than other varieties but for cat owners that have pets that prefer it, it is worth the investment to save the more expensive furniture they will inevitably use if nothing else is available. If you want to keep your cat’s scratching post as clean as possible that is actually fairly simple. Regardless of whether you have sisal rope or carpeting, you can use the same method. Get a stiff brush and brush the cat scratching post, getting rid of dirt and fur that have built up on it. Once it is free of both of those. Lightly spray with a disinfectant spray and let dry thoroughly. That’s all there is to it. The best scratching post in the world is useless if your cats won’t use it. There are ways to get your cat used to the post and “train” them to use it rather than other parts of the home, such as your expensive furniture or doorframes. To ensure the best chance of your cat taking to its new post, make sure that it is the right size for them to stretch upwards or if they like horizontal scratching that it is in the right position so they can scratch the way they like to. You can rub catnip on the rope or carpet to entice cats to it. This will help with their acceptance of the post and will make them want to hang around and use it. Never, ever punish your cat for using something else to scratch on. You want to use positive reinforcement and not fear or yelling, which never work with a cat anyway. Another method you can use is to take a soft cloth and wipe the areas around his face to get his scent and then rub that same cloth on the cat post. He will be able to smell his own familiar and soothing scent on the post which will automatically make it less frightening to him. Every time you see your cat using the cat scratching post, praise them with a pat or a small treat. If they are taught gently and with patience they WILL learn to use it, especially if you have purchased one that takes his natural tendencies into consideration. Cat scratching posts come in so many different sizes, styles and shapes that it can be a little overwhelming to figure out which one your cat is going to like. Since the cats can’t speak for themselves, your best bet is to observe your cat’s behavior and routines for a few days such as what they like to do when they play, where they are currently scratching, how they scratch (horizontal or vertical) and other things about them. You’ll be able to take this information and use it when you are comparing features to decide which type will fit your cat’s personality the best. Cat scratching posts are an excellent way to feed the need your cats have to scratch and save your belongings as well. With the information you have learned in this buyer’s guide and the top rated cat scratching post reviews you have everything you need to make a choice that will work for your cats and your preferences as well. With all of the choices that you have available when it comes to shape, size, material and even color, there’s no reason you can’t find exactly what your cat or cats will love and that will fit your home well also. If you have kittens, starting them off with a great cat scratching post will ensure that you don’t have to worry about your furniture or doorframes.